The relaxed ambience and offbeat location set this urbane modern Italian restaurant apart from its neighbouring rivals. The decor is modern and airy with a friendly, unpretentious atmosphere and attentive service. 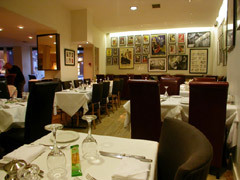 La Cucina is conveniently located close to Farringdon and Barbican tube stations. Alfresco is available weather permitting. If your idea of a perfect group event involves lots of different wines, accompanied by modern Italian cuisine chosen with enough finesse to impress, then La Cucina should be on your short list. No private room is available, but the entire restaurant can be hired on request. Their extensive menu focuses on wholesome Italian ingredients, listing both old favourites and new dishes. There's an interesting range of Italian specialities all served with panache and a heavy Italian wine list which rounds everything off nicely.